Coffeyville, KS-Nearly two years to the day, Garden City captured their first Jayhawk Conference title in 15 years. On Saturday, they took one major step towards doing it again. Dedrick Mills ran wild, totaling 262 yards rushing on 44 carries, while the defense forced three turnovers, as the second-ranked Broncbusters ripped through Coffeyville 51-15 at Veteran’s Memorial Stadium. Mills had 163 yards and three touchdowns in the first half. But surprisingly, Garden City (8-0, 5-0) found themselves in a dog fight despite completely outplaying the Red Ravens. On Coffeyville’s (3-6, 2-5) second possession, Arkansas-transfer Carson Proctor was staring at a third-and-13 from his own 5. But Garden City had a breakdown on the back end, and the sophomore signal caller hit Josh Moore in stride on a post for a 95-yard touchdown to give the Red Ravens a 7-0 advantage. The Broncbusters were not down for long. 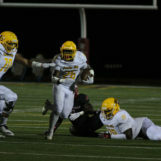 Mills carried the rock eight times the next time Garden City had the ball including a 14-yard sprint to the end zone that punctuated a nine-play, 77-yard drive that tied the game with 3:17 to go in the first. Next it was the defense’s turn to make a play, and Proctor never had a chance. On third-and-24 from the Red Raven 6, Proctor was sacked in the end zone by Dillon Williams and Jabbar Price to make it 9-7. Then, following the ensuing free kick, Mills got loose, ripping off a 51-yard run that put Garden City at the Coffeyville 3. Moments later, the Nebraska-commit, slammed his way across the goal line to give the Broncbusters a 16-7 edge at the 14:57 mark of the second. Garden City was gifted a scoring opportunity when Nicholas Hernandez bobbled James Dall’s punt, which Kenny White recovered at the 2. On the next play, Mills barreled across the goal line, putting the road team up by 16 with 8:29 remaining until halftime. One of those miscues came when Ben Raybon’s low, line-drive, 34-yard field goal was blocked by Richerd Jones and returned 70 yards by Brion Murray for a touchdown. Procter then hit Marco Lee on a screen pass on the two-point conversion, and the Red Ravens sliced the Broncbuster lead to 23-15. “That should have never happened,” Sims said. In the second half, the Broncbusters put the clamps down. Josh Hager’s unit allowed just 45 yards and two first downs over the final 30 minutes, all while the offense found another gear. Mills added his fourth rushing touchdown of the night on the Broncbusters first possession of the second half: a 14-yard scamper that put Garden City up 30-15. Later in the period, quarterback David Moore juked out two defenders for a one-yard score, before slinging a 14-yard scoring toss to Keandre Bledsoe that gave the road squad a 29-point advantage. Ellis Merriweather capped off the scoring in the fourth period with a one-yard rushing touchdown, putting the finishing touches on another offensive masterpiece where Garden City rushed for 338 yards on 71 carries. It was the second straight week they scored 50 or more points. Moore finished 6-of-10 for 54 yards and a touchdown, and Merriweather added 72 yards on 19 carries. Bledsoe caught two balls for 19 and Joe Jay Smith had three tackles, a quarterback hurry and an interception. Proctor completed just 5-of-17 passes for 119 yards, a touchdown and a pick for Coffeyville, who lost to Garden City for the third consecutive time. Darius Hopkins had six carries for 23, and Moore reeled in six balls for 130 and a score.